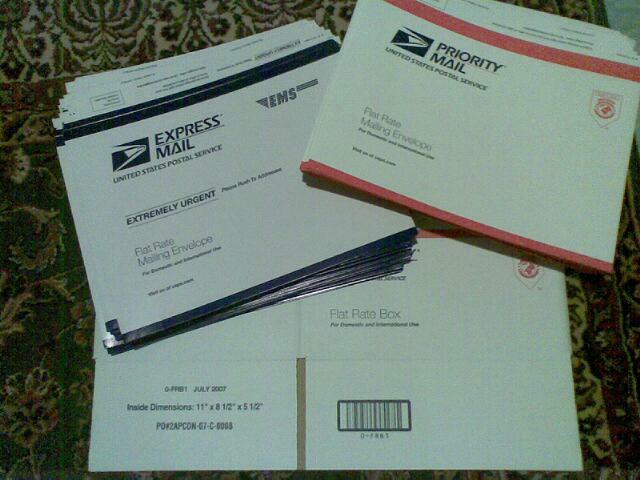 Some of the free mailing materials I've received over the past few months. This is a trick I learned a few years ago when selling products on eBay and mailing things to friends through the United States Postal Service. Using a hidden, but completely legal and safe trick, you can have up to 500 Flat rate USPS Priority Mail boxes (in about 15 different sizes), Priority Mail envelopes, and Express Mail envelopes and boxes mailed to you completely free of charge in 2-3 business days. As a result, you can walk into the Post Office, pay postage, and leave much quicker than you ever did before. Priority mail gets to the person in typically 2-3 business days (I usually see it on the shorter side; a package I mailed from NH to PA last week was two days), while Express Mail has a 1 day turn around. If you’re a business person, there’s also free invoice mailing forms, customs declaration forms, and mailing labels (among others) available on the website.